​The Mississippi Statewide Independent Living Council quarterly meeting will be held on Thursday, May 16, 2019 beginning at 12:00 PM located at the Mississippi Department of Rehabilitation Building (MDRS) at 1281 Hwy. 51, N, Madison, MS 39110.The public is invited to attend and to make comments. To address the Council for public comment, person(s) should make arrangements in advance by contacting Mary Allsup at wecandoit2gether@yahoo.com or by phoning 601-853-5215 . If special accommodations are needed, please contact Mary Allsup at least 5 days prior to the meeting. ​The Legislature has designated the last Monday of April as the day for the observance of Confederate Memorial Day. Therefore, at the discretion of the Executive Director, all offices will be closed on Monday, April 29, 2019 to celebrate this holiday. The Legislature has designated the third Monday of February​ as the day for the observance of the birthday of George Washington. Therefore, at the discretion of the Executive Director, all offices will be closed on Monday, February 18, 2019 to celebrate this holiday. ​NOTICE is hereby given of a meeting of the Mississippi Department of Rehabilitation Services to be held on Tuesday, February 12, 2019 beginning at 10:00 a.m. in the board room of the Mississippi Department of Rehabilitation's office located at 1281 Highway 51 North, Madison, MS 39110. Participation at this meeting may be by teleconference at locations different from the above location pursuant to Miss. Code Ann. §25-41-5, as amended, with participation being available to the public at the location set forth above. The purpose of the meeting is to conduct the regular business of the board as set forth in the attached draft agenda. Therefore, at the discretion of the Executive Director, all offices will be closed on Monday, January 21, 2019 to celebrate this holiday. ​The Mississippi Statewide Independent Living Council quarterly meeting will be held on Thursday, February 21, 2019 beginning at 12:00 PM located at the Mississippi Department of Rehabilitation Building (MDRS) at 1281 Hwy. 51, N, Madison, MS 39110. The public is invited to attend and to make comments. To address the Council for public comment, person(s) should make arrangements in advance by contacting Mary Allsup at wecandoit2gether@yahoo.com or by phoning 601-853-5215 . If special accommodations are needed, please contact Mary Allsup at least 5 days prior to the meeting. ​The Governor has declared the closing of all offices in the State of Mississippi on Tuesday, January 1, 2019, in observance of NEW YEAR’S DAY. Therefore, at the discretion of the Executive Director, all MDRS offices on Monday, December 31, 2018, and Tuesday, January 1, 2019 will be closed in observance of the New Year's Day. ​The Governor has declared the closing of all offices in the State of Mississippi on Tuesday, December 25, 2018, in observance of CHRISTMAS DAY. Therefore, at the discretion of the Executive Director, all MDRS offices on Monday, December 24, 2018 and Tuesday, December 25, 2018 will be closed in observance of the CHRISTMAS HOLIDAY. The State Rehabilitation Council meeting will be held at the MS Department of Rehabilitation Services building located in Madison at 10:00 AM on December 14, 2018. The public is invited to attend and make comments. ​The Governor has declared the closing of all offices in the State of Mississippi on Thursday, November 22, 2018, in observance of THANKSGIVING DAY. Therefore, at my discretion, I am authorizing the closing of all MDRS offices on Thursday, November 22, 2018, and Friday, November 23, 2018 in observance of the THANKSGIVING HOLIDAY. ​The Mississippi Statewide Independent Living Council quarterly meeting will be held on Thursday, November 15, 2018 beginning at 12:00 PM located at the Mississippi Department of Rehabilitation Building (MDRS) at 1281 Hwy. 51, N, Madison, MS 39110. ​The Legislature has designated the eleventh day of November as the day for the observance of Veteran's Day. Therefore, at the discretion of the Executive Director, all offices will be closed on Monday, November 12, 2018 to celebrate this holiday. The Legislature has designated the first Monday in September as the day for the observance of LABOR DAY. Therefore, at the discretion of the Executive Director, all offices will be closed on Monday, September 3, 2018 to celebrate this holiday. ​The Mississippi Statewide Independent Living Council quarterly meeting will be held on Thursday, August 16, 2018 beginning at 12:00 PM located at the Mississippi Department of Rehabilitation Building (MDRS) at 1281 Hwy. 51, N, Madison, MS 39110. The public is invited to attend and to make comments. To address the Council for public comment, person(s) should make arrangements in advance by contacting Mary Allsup at wecandoit2gether@yahoo.com or by phoning 601-853-5215 . If special accommodations are needed, please contact Mary Allsup at least 5 days prior to the meeting. The State Board of Rehabilitation Services will meet at 10:00 AM on Tuesday, August 14, 2018 at the Mississippi Department of Rehabilitation Services State Office Complex located at 1281 Highway 51 North in Madison. The public is invited to attend and make comments. To address the Council for public comment, person(s) should make arrangements in advance by contacting Kelly Angulo, MDRS Executive Assistant, at kangulo@mdrs.ms.gov or 1-800-443-1000, ext. 35203. If special accommodations are needed, please notify Ms. Angulo at least 5 days prior to the meeting. ​The Legislature has designated the first Wednesday of July as the day for the observance of Independence Day. Therefore, at my discretion, I am authorizing the closing of all MDRS offices on Wednesday, July 4, 2018 in observance of the INDEPENDENCE HOLIDAY. ​The State Rehabilitation Council June Meeting will be held at 10:00 a.m., Friday, June 22, 2018, in the Executive Conference Room of the MDRS Building, 1281 Hwy. 51 North, Madison, MS. The Legislature has designated the last Monday of May for the observance of National Memorial Day/Jefferson Davis' Birthday. ​The State Board of Rehabilitation Services will meet 10:00 a.m., Tuesday, May 22, 2018, in the 2nd floor west conference room of the MDRS Building, 1281 Hwy. 51 North, Madison, MS.
​The Mississippi Statewide Independent Living Council quarterly meeting will be held on Thursday, May 17, 2018 beginning at 12:00 PM located at the Mississippi Department of Rehabilitation Building (MDRS) at 1281 Hwy. 51, N, Madison, MS 39110.The public is invited to attend and to make comments. To address the Council for public comment, person(s) should make arrangements in advance by contacting Mary Allsup at wecandoit2gether@yahoo.com or by phoning 601-853-5215 . If special accommodations are needed, please contact Mary Allsup at least 5 days prior to the meeting. The event is co-sponsored by the Governor’s Office and our office (Offices of Vocational Rehabilitation and Vocational Rehabilitation for the Blind). ​For employer registration, click here. ​The Legislature has designated the last Monday of April as the day for the observance of Confederate Memorial Day. Therefore, at the discretion of the Executive Director, all offices will be closed on Monday, April 30, 2018 to celebrate this holiday. For employer registration, click here. 350 W Woodrow Wilson Ave.
406 N. Martin Luther King Dr.
​NOTICE is hereby given of a meeting of the Mississippi Department of Rehabilitation Services to be held on Tuesday, March 13th, 2018 beginning at 10:00 a.m. in the board room of the Mississippi Department of Rehabilitation’s office located at 1281 Highway 51 North, Madison, MS 39110. Participation at this meeting may be by teleconference at locations different from the above location pursuant to Miss. Code Ann. §25-41-5, as amended, with participation being available to the public at the location set forth above. The purpose of the meeting is to conduct the regular business of the board as set forth in the attached draft agenda. ​The Legislature has designated the third Monday of February as the day for the observance of the birthday of George Washington. Therefore, at the discretion of the Executive Director, all offices will be closed on Monday, February 19, 2018 to celebrate this holiday. ​The Mississippi Statewide Independent Living Council quarterly meeting will be held on Thursday, February 15, 2018 beginning at 12:00 PM located at the Mississippi Department of Rehabilitation Building (MDRS) at 1281 Hwy. 51, N, Madison, MS 39110.The public is invited to attend and to make comments. To address the Council for public comment, person(s) should make arrangements in advance by contacting Augusta Smith at lifeofms@aol.com or by phoning 601-969-4009 . If special accommodations are needed, please contact Augusta Smith at least 5 days prior to the meeting. Therefore, at the discretion of the Executive Director, all offices will be closed on Monday, January 15, 2018 to celebrate this holiday. ​The State Rehabilitation Council December 2017 meeting postponed due to weather will be held January 12, 2018 at 10:00 am at the Madison Complex, 3rd floor Conference room. ​The Governor has declared the closing of all offices in the State of Mississippi on Monday, January 1, 2018, in observance of New Year's Day. ​All MDRS offices will be closed in the observance of Christmas. ​The Governor has declared the closing of all offices in the State of Mississippi on Monday, December 25, 2017, in observance of Christmas Day. The State Rehabilitation Council will meet at 10:00 AM on Friday, December 8, 2017 at the Mississippi Department of Rehabilitation Services State Office Complex located at 1281 Highway 51 North in Madison. The public is invited to attend and make comments. To address the Council for public comment, person(s) should make arrangements in advance by contacting Betsy Simoneaux, SRC Coordinator, at bsimoneaux@mdrs.ms.gov or 1-800-443-1000, ext. 35336. If special accommodations are needed, please notify Ms. Simoneaux at least 5 days prior to the meeting. ​The Mississippi Traumatic Brain Injury/Spinal Cord Injury Trust Fund Advisory Council will meet at 12:00 PM on Friday, December 1, 2017 at the Mississippi Department of Rehabilitation Services State Office Complex located at 1281 Highway 51 North in Madison. The public is invited to attend and to make comments. To address the Council for public comment, person(s) should make arrangements in advance by contacting Allison Lowther, TBI/SCI Trust Fund Coordinator, at alowther@mdrs.ms.gov or 1-800-443-1000, ext. 35297. If special accommodations are needed, please contact Ms. Lowther at least 5 days prior to the meeting. All MDRS offices will be closed in the observance of Thanksgiving. ​All MDRS offices will be closed in the observance of Thanksgiving.The Governor has declared the closing of all offices in the State of Mississippi on Thursday, November 23, 2017, in observance of Thanksgiving Day. The Mississippi Statewide Independent Living Council quarterly meeting will be held on Tuesday, November 21, 2017 beginning at 12:00 PM located at the MDRS State Office Building, 1281 Highway 51N., Madison, MS 39110. The public is invited to attend and to make comments. To address the Council for public comment, person(s) should make arrangements in advance by contacting Augusta Smith, Interim Chairperson, at lifeofms@aol.com or 601-969-4009. If special accommodations are needed, please contact Ms. Smith at least 5 days prior to the meeting. Therefore, at the discretion of the Executive Director, all offices will be closed on Friday, November 10, 2017 to celebrate this holiday. The State Board of Rehabilitation Services will meet at 10:00 AM on Tuesday, November 14, 2017 at the Mississippi Department of Rehabilitation Services State Office Complex located at 1281 Highway 51 North in Madison. 5.75 CRC hours available during this Conference and .75 CEU hours. The State Rehabilitation Council will meet at 10:00 AM on Friday, September 8, 2017 at the Mississippi Department of Rehabilitation Services State Office Complex located at 1281 Highway 51 North in Madison. ​The Legislature has designated the first Monday in September as the day for the observance of Labor Day. ​The Mississippi Traumatic Brain Injury/Spinal Cord Injury Trust Fund Advisory Council will meet at 12:00 PM on Friday, September 1, 2017 at the Mississippi Department of Rehabilitation Services State Office Complex located at 1281 Highway 51 North in Madison. The Mississippi Statewide Independent Living Council quarterly meeting will be held on Tuesday, August 15, 2017 beginning at 12:00 PM located at the MDRS State Office Building, 1281 Highway 51N., Madison, MS 39110. Life changes after a disability…you have to learn a new way to do the things you used to. MDRS is here to help by supporting groups with innovative ideas that help individuals with disabilities adapt to their new normal. With funding awarded through MDRS’ Office of Special Disabilities Traumatic Brain Injury/Spinal Cord Injury Trust Fund, the North Mississippi Medical Center’s Adaptive Ski Clinic helps individuals with disabilities to experience and enjoy the thrill of water sports by using the latest in adaptive equipment. NMMC Rehabilitation Services sponsors free Adaptive Water Ski Clinics each summer at Elvis Presley State Park. Individuals who are at least one year post-spinal cord injury or traumatic brain injury, or who have other physical limitations, are eligible. Registration is required. To register or for more information, call the NMMC Outpatient Rehabilitation Center at (662) 377-7215 or 1-800-THE DESK (1-800-843-3375). The State Board of Rehabilitation Services will meet at 10:00 AM on Tuesday, August 8, 2017 at the Mississippi Department of Rehabilitation Services State Office Complex located at 1281 Highway 51 North in Madison. ​The Legislature has designated the first Tuesday of July as the day for the observance of Independence Day. Therefore, at the discretion of the Executive Director, all MDRS offices will be closed on Monday, July 3, 2017 and Tuesday, July 4, 2017 in observance of the Independence Holiday. The event is co-sponsored by the Governor's Office and our office (offices of Vocational Rehabilitation and Vocational Rehabilitation for the Blind). The State Rehabilitation Council will meet at 10:00 AM on Friday, June 7, 2017 at the Mississippi Department of Rehabilitation Services State Office Complex located at 1281 Highway 51 North in Madison. ​The Mississippi Traumatic Brain Injury/Spinal Cord Injury Trust Fund Advisory Council will meet at 12:00 PM on Friday, June 2, 2017 at the Mississippi Department of Rehabilitation Services State Office Complex located at 1281 Highway 51 North in Madison. Therefore, at the discretion of the Executive Director, all offices will be closed on Monday, May 29, 2017 to celebrate this holiday. The State Board of Rehabilitation Services will meet at 10:00 AM on Tuesday, May 23 2017 at the Mississippi Department of Rehabilitation Services State Office Complex located at 1281 Highway 51 North in Madison. The Office on Deaf and Hard of Hearing Advisory Board will meet at 11:00 AM on Saturday, May 20, 2017 at the Mississippi Department of Rehabilitation Services Beasley Office located at 13895 Beasley Road in Jackson. The public is invited to attend and make comments. To address the Council for public comment, person(s) should make arrangements in advance by contacting Ben Wagenknecht, ODHH Director, at bwagenknecht@mdrs.ms.gov or 1-601-898-7052. If special accommodations are needed, please notify Mr. Wagenknecht at least 5 days prior to the meeting. The Mississippi Statewide Independent Living Council quarterly meeting will be held on Tuesday, May 16, 2017 beginning at 12:00 PM located at the MDRS State Office Building, 1281 Highway 51N., Madison, MS 39110. The North MS EmployAbility Job Fair will be held Tuesday, May 16, 2017 9am-1pm, at the Southaven Arena, 7360 Hwy 51 North, Southaven, MS. Therefore, at the discretion of the Executive Director, all offices will be closed on Monday, April 24, 2017 to celebrate this holiday. ​The Fourth Annual EmployAbility Job Fair will be held Thursday, March 29, 2017, 9am-1pm, at the Jackson Medical Mall, Thad Cochran Center, 350 W. Woodrow Wilson Avenue, Jackson. The State Rehabilitation Council will meet at 10:00 AM on Friday, March 24, 2017 at the Mississippi Department of Rehabilitation Services State Office Complex located at 1281 Highway 51 North in Madison. The public is invited to attend and make comments. To address the Council for public comment, person(s) should make arrangements in advance by contacting Betsy Simoneaux, SRC Coordinator at bsimoneaux@mdrs.ms.gov or 1-800-443-1000, ext. 35336. If special accommodations are needed, please notify Ms. Simoneaux at least 5 days prior to the meeting. ​The Ms. Wheelchair MS Pageant is an annual event, which gives ladies who use wheelchairs an opportunity to make new friends, gain confidence, enhance public speaking skills, and advocate for disability issues. The winner gets to represent the Magnolia State at Ms. Wheelchair America August 14-20, 2017 in Erie, Pennsylvania! The 2017 contestants are Rebecca Grace Sentell, Rochelle Ledbetter Wilks, Uniqua L. Atkinson, and Pamela Phillips. Our very own Ms. Wheelchair MS, LisaAnn Redd, from Vicksburg, MS is speaking. Laura Lee Lewis, Miss Mississippi, is going to sing, Senator Sally Dotty is the Keynote Speaker, and several Ballet Magnificat dancers are dancing. Are you ready to RISE? We look forward to seeing you at 7 pm at the Madison Central High School Auditorium to witness the crowning of Mississippi's next "roll' model! Doors open at 6:30 pm. ​The Mississippi Traumatic Brain Injury/Spinal Cord Injury Trust Fund Advisory Council will meet at 12:00 PM on Friday, March 3, 2017 at the Mississippi Department of Rehabilitation Services State Office Complex located at 1281 Highway 51 North in Madison. The Mississippi Statewide Independent Living Council quarterly meeting will be held on Thursday, February 23,2017 beginning at 12:00 PM located at the MDRS State Office Building, 1281 Highway 51N., Madison, MS 39110. The State Board of Rehabilitation Services will meet at 10:00 AM on Tuesday, February 21, 2017 at the Mississippi Department of Rehabilitation Services State Office Complex located at 1281 Highway 51 North in Madison. Therefore, at the discretion of the Exective Director, all offices will be closed on Monday, February 20, 2017 to celebrate this holiday. ​The Legislature has designated the third Monday in January as the day for the observance of Robert E. Lee/Martin Luther King Day. Therefore, at the discretion of the Executive Director, all offices will be closed on Monday, January 16, 2017 to celebrate this holiday. ​​​The Governor has declared the closing of all offices in the State of Mississippi on Sunday, January 1, 2017, in observance of NEW YEAR'S DAY. ​​The Governor has declared the closing of all offices in the State of Mississippi on Sunday, December 25, 2016, in observance of CHRISTMAS DAY. The TBI SCI Trust Fund Advisory Council meeting will be held at the MS Department of Rehabilitation Services building located in Madison at 12:00 noon on December 2, 2016 in the Executive Board Room. The State Rehabilitation Council meeting will be held at the MS Department of Rehabilitation Services building located in Madison at 10:00 AM on December 2, 2016. The public is invited to attend and make comments. ​​The Governor has declared the closing of all offices in the State of Mississippi on Thursday, November 24, 2016, in observance of THANKSGIVING DAY. The Mississippi Statewide Independent Living Council quarterly meeting will be held on Tuesday, November 15, 2016 beginning at 12:00 PM located at the Mississippi Department of Rehabilitation Building (MDRS) at 1281 Hwy. 51, N, Madison, MS 39110. The public is invited to attend and to make comments. To address the Council for public comment, person(s) should make arrangements in advance by contacting Augusta Smith at lifeofms@aol.com or by phoning 601-969-4009. If special accommodations are needed, please contact MS. Jan Cloud at least 5 days prior to the meeting. Therefore, at the discretion of the Executive Director, all offices will be closed on Friday, November 11, 2016 to celebrate this holiday. The State Board of Rehabilitation Services meeting will be held at the MS Department of Rehabilitation Services building located in Madison at 10:00am on November 8, 2016 in the Executive Board Room. ​The State Rehabilitation Council Meeting will be held at 10:00 AM on Wednesday, October 12, 2016 at the Mill Conference Center located at 600 Russell Street in Starkville, MS.
​The 10th annual fundraising event sponsored by LIFE of Mississippi - benefitting Mississippians with disabilities will be held Saturday, September 24, 2015 at 9:00 AM. The ODHH Advisory Board meeting will be held at the AbilityWorks building located Jackson at 11:00 AM on Saturday, September 17, 2016. ​​The legislature has designated the first Monday in September as the day for the observance of LABOR DAY. Therefore, at the discretion of the Executive Director, all offices will be closed on Monday, September 5, 2016 to celebrate this holiday. The TBI SCI Trust Fund Advisory Council meeting will be held at the MS Department of Rehabilitation Services building located in Madison at 12:00 noon on September 2, 2016 in the Executive Board Room. The Mississippi Statewide Independent Living Council quarterly meeting will be held on Friday, August 26, 2016 beginning at 12:00 PM located at the Mississippi Department of Rehabilitation Building (MDRS) at 1281 Hwy. 51, N, Madison, MS 39110. The public is invited to attend and to make comments. To address the Council for public comment, person(s) should make arrangements in advance by contacting Augusta Smith at lifeofms@aol.com or by phoning 601-969-4009. If special accommodations are needed, please contact MS. Jan Cloud at least 5 days prior to the meeting. The State Board of Rehabilitation Services meeting will be held at the MS Department of Rehabilitation Services building located in Madison at 10:00am on August 16, 2016 in the Executive Board Room. ​The Legislature has designated the first Monday of July as the day for the observance of Independence Day. Therefore, at the discretion of the Executive Director, all offices will be closed on Monday, July 4, 2016 to celebrate this holiday. ​MDRS is hosting a helmet giveaway at its Madison location, 1281 Highway 51 North, on June 20, 3:30-6:30 p.m. Parents, bring your children (ages 3-12) and have them fitted by specialists with the MDRS Office of Special Disability Programs, Traumatic Brain Injury/Spinal Cord Injury Trust Fund for a FREE HELMET. Parents who bring their children to the helmet giveaway can register to win one of two bikes being given away courtesy of a private donor. A third bike, a 20” girls Huffy, will be given away to eligible contestants who like and share our MDRS facebook page/post. The State Rehabilitation Council meeting will be held at the MS Department of Rehabilitation Services building located in Madison at 10:00 AM on June 10, 2016. The public is invited to attend and make comments. The TBI SCI Trust Fund Advisory Council meeting will be held at the MS Department of Rehabilitation Services building located in Madison at 12:00 noon on June 3, 2016 in the Executive Board Room. Therefore, at the discretion of the Executive Director, all offices will be closed on Monday, May 30, 2016 to celebrate this holiday. The Mississippi Statewide Independent Living Council quarterly meeting will be held on Tuesday, May 17, 2016 beginning at 12:00 PM located at the Mississippi Department of Rehabilitation Building (MDRS) at 1281 Hwy. 51, N, Madison, MS 39110.The public is invited to attend and to make comments. To address the Council for public comment, person(s) should make arrangements in advance by contacting Jan Cloud at canehunter@cableone.net or by phoning 228-392-5496. If special accommodations are needed, please contact MS. Jan Cloud at least 5 days prior to the meeting. The State Board of Rehabilitation Services meeting will be held at the MS Department of Rehabilitation Services building located in Madison at 10:00am on May 10, 2016 in the Executive Board Room. Therefore, at the discretion of the Executive Director, all offices will be closed on Monday, April 25, 2016 to celebrate this holiday. ​The Third Annual EmployAbility Job Fair will be held Thursday, March 31, 2016, 10am-3pm, at the Jackson Medical Mall, Thad Cochran Center, 350 W. Woodrow Wilson Avenue, Jackson. ​​Applications for the 2016 Ms. Wheelchair Mississippi Pageant are now being accepted. The pageant will be held March 12 at the Madison Central High School Auditorium. The pageant is not a beauty competition. Pageant organizers say the ideal candidate will be the best communicator and advocate for individuals affected by disability. Contestants must be 21 and older, and must be full-time wheelchair users in their community. 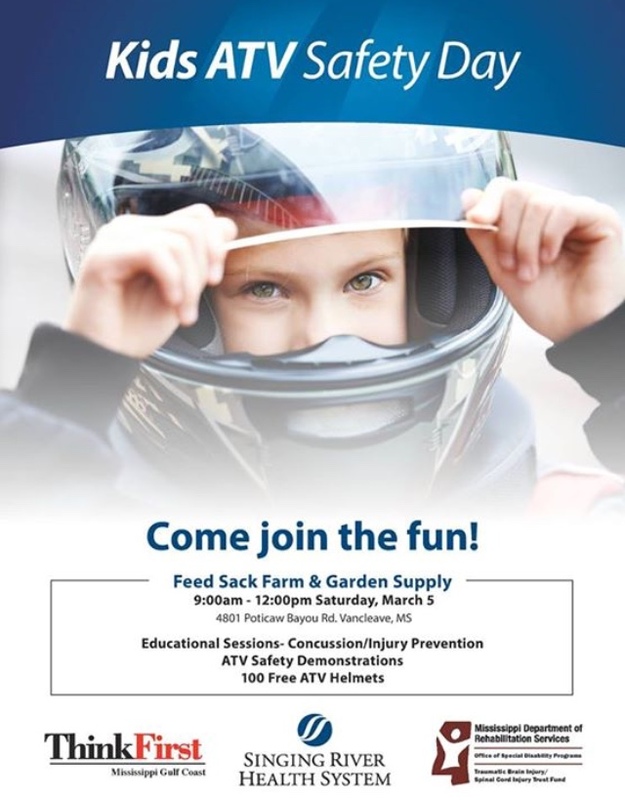 ​Kids ATV Safety Day is March 5, 2016 in Vancleave, MS. The State Rehabilitation Council meeting will be held at the MS Department of Rehabilitation Services building located in Madison at 10:00 AM on March 4, 2016. The public is invited to attend and make comments. The TBI SCI Trust Fund Advisory Council meeting will be held at the MS Department of Rehabilitation Services building located in Madison at 12:00 noon on March 4, 2016 in the Executive Board Room. ​The Mississippi Statewide Independent Living Council quarterly meeting will be held on Tuesday, February 16, 2016 beginning at 12:00 PM located at the Mississippi Department of Rehabilitation Building (MDRS) at 1281 Hwy. 51, N, Madison, MS 39110.The public is invited to attend and to make comments. To address the Council for public comment, person(s) should make arrangements in advance by contacting Jan Cloud at canehunter@cableone.net or by phoning 228-392-5496. If special accommodations are needed, please contact MS. Jan Cloud at least 5 days prior to the meeting. The Legislature has designated the third Monday of February as the day for the observance of the birthday of George Washington. Therefore, at the discretion of the Executive Director, all offices will be closed on Monday, February 15, 2016 to celebrate this holiday. ​The State Board of Rehabilitation Services will meet 10:00 a.m., Tuesday, February 9, 2016, in the Executive Board Room of the MDRS Building, 1281 Hwy. 51 North, Madison, MS.
​The Legislature has designated the third Monday in January as the day for the observance of Robert E. Lee and Martin Luther King Day. ​The Governor has declared the closing of all offices in the State of Mississippi on Friday, January 1, 2016, in observance of NEW YEAR’S DAY. The meeting will start at 10:00 am on Friday, December 4th, 2015. The Traumatic Brain Injury/Spinal Cord Injury Trust Fund Advisory Council meeting will be held at 12:00 PM at the MS Department of Rehabilitation Services building located in Madison.​ The public is invited to attend and to make comments. ​The Governor has declared the closing of all offices in the State of Mississippi on Thursday, November 26, 2015, in observance of THANKSGIVING DAY. ​The Mississippi Statewide Independent Living Council quarterly meeting will be held on Thursday, November 24, 2015 beginning at 12:00 PM located at the Mississippi Department of Rehabilitation Services (MDRS) Building at 1281 Hwy. 51 North, Madison, MS 39110. The public is invited to attend and to make comments. To address the Council for public comment, person(s) should make arrangements in advance by contacting Jan Cloud at canehunter@cableone.net or 228-392-5496. If special accommodations are needed, please contact Jan Cloud at least 5 days prior to the meeting. ​The State Board of Rehabilitation Services meeting will be held at 10:00 AM at the MS Department of Rehabilitation Services building located in Madison. The public is invited to attend and to make comments. The Legislature has designated the eleventh day of November as the day for the observance of Veteran's Day. ​The State Rehabilitation Council quarterly meeting will be held on Monday, October 5, 2015, at 10:00 a.m. in the Azalea Room D at the Beau Rivage, 875 Beach Blvd. Biloxi, MS 39530. The public is invited to attend and to make comments. This meeting will provide an opportunity for interested citizens, especially those with disabilities, to review and comment on issues pertinent to the Vocational Rehabilitation and Vocational Rehabilitation for the Blind programs of the Mississippi Department of Rehabilitation Services. All comments for the council's meeting should be received during the meeting or submitted in writing and sent to bsimoneaux@mdrs.ms.gov or mailed to P.O. Box 1698, Jackson, MS 39215-1698. All comments will be noted and recorded. For further information regarding the State Rehabilitation Council, call 1-800-443-1000 ext. 5332. Equipment will be on display to allow you a "hands on" experience with some of the latest technology. Moreinformation will be forthcoming, so please save the date and plan to join us. Therefore, at the discretion of the Executive Director, all offices will be closed on Monday, September 7, 2015 to celebrate this holiday. The public hearing of the State Workforce Investment Board (SWIB) seeking public comment on the state’s Workforce Innovation and Opportunity Act (WIOA) plan scheduled for Friday, August 14, at 9:00 a.m. in the Clyde Muse Center has been cancelled. Details of the rescheduled meeting will be posted to http://swib.ms.gov/ once they are finalized. ​The State Board of Rehabilitation Services will meet for a special telephonic meeting at 10:00 a.m., Thursday, July 23, 2015 in the Executive Conference Room of the MDRS Building, 1281 Hwy. 51 North, Madison, MS.
​The Legislature has designated the fourth day of July as the day for the observance of Independence Day/ July 4th. ​The Legislature has designated the last Monday in May as the day for the observance of NATIONAL MEMORIAL DAY/Jefferson Davis' Birthday. Therefore, at the discretion of the Executive Director, all offices will be closed on MONDAY, MAY 25, 2015 to celebrate this holiday. ​The State Board of Rehabilitation Services will meet at 10:00 a.m., Tuesday, May 12, 2015, in the Executive Conference Room of the MDRS Building, 1281 Hwy. 51 North, Madison, MS. The Legislature has designated the last Monday of April as the day for the observance of Confederate Memorial Day. Therefore, at the discretion of the Executive Director, all offices will be closed on Monday, April 27, 2015 to celebrate this holiday. ​The 2nd Annual EmployAbility JOB Fair, promoting the hiring of Mississippians with disabilities, will be held at the MS Agriculture and Forestry Museum in Jackson, MS on Wednesday, March 4, 2015 from 10 am to 3:00 pm. ​The State Board of Rehabilitation Services will meet at 10:00 a.m., Tuesday, February 10, 2015, in the Executive Conference Room of the MDRS Building. 1/1/2015 | The building will be closed. ​The next SRC meeting will be held on Friday September 5,2014 at 10:00AM in the 3rd Floor Conference Room with lunch immediately following. The State Board of Rehabilitation Services will meet at 10:00 a.m., Tuesday, August 12, 2014, in the Executive Board Room of the MDRS Building, 1281 Hwy. 51 North, Madison, MS. The next meeting for the SRC will be held March 7, 2014 at Beasley Rd, AbilityWorks, 2nd Floor Conference Room. Due to inclement weather conditions, the State Board of Rehabilitation Services quarterly meeting scheduled for Tuesday, February 11, 2014 was postponed. The meeting is now scheduled for 10:00 a.m. Thursday, February 27, 2014 in the Executive Conference Room of the MDRS Building, which is located at 1281 Hwy. 51 North, Madison, MS.
​The Mississippi Statewide Independent Living Council quarterly meeting will be held on Thursday, February 13, 2014 beginning at 12:00 PM located at the Mississippi Department of Rehabilitation Building (MDRS) at 1281 Hwy. 51, N, Madison, MS 39110.The public is invited to attend and to make comments. To address the Council for public comment, person(s) should make arrangements in advance by contacting Jan Cloud at canehunter@cableone.net or by phoning 228-392-5496. If special accommodations are needed, please contact MS. Jan Cloud at least 5 days prior to the meeting.